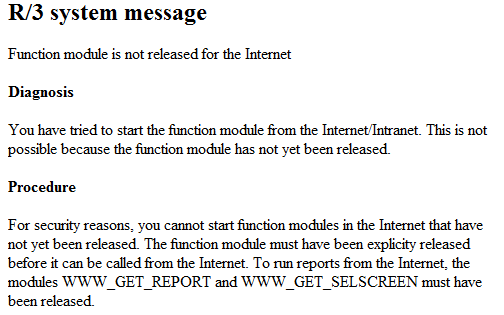 ABAP developer calling WebRfc before release function module to internet will experience "Function module is not released for the Internet" error message. Simply, after you create WebRfc function module as an ABAP developer, you have to release function module for internet using SMW0 SAP Web Repository transaction. Although it is possible to test and execute the function module within SE37 transaction, it is not possible to call webRfc from intranet or internet without error. If you are a script developer working on SAP Screen Personas 3.0 flavors, you can refer to Personas tutorial how to add new FM to Personas function module whitelist to enable that FM to be called within Personas scripts. Here is the error message when ABAP programmers will get when WebRFC call is executed before it is released to internet. You have tried to start the function module from the Internet/Intranet. This is not possible because the function module has not yet been released. For security reasons, you cannot start function modules in the Internet that have not yet been released. The function module must have been explicity released before it can be called from the Internet. To run reports from the Internet, the modules WWW_GET_REPORT and WWW_GET_SELSCREEN must have been released. In order to release function module to internet and enabling webrfc from internet, ABAP developers can use SMW0 tcode namely SAP Web Repository transaction. Enter the function module name into the textbox and press Release icon marked with red as follows. If everything is OK on the SAP system side, you will be displayed an informative success message. Afterwards, releasing the function module created as a webrfc, ABAP programmers can use and call webrfc from SAP Personas or other web applications.